On their way out the door yesterday, I told one of my photography classes to be looking for “shape” and “negative space” for the rest of the day. Of course they wanted to know if I’m actually always thinking about the same things, and while those particular design elements are not often at the front of my mind, the question reminded me of the accompanying photo. On my way home from work a couple weeks ago (riding a bike helps keep the connection with what’s going on around you), I was completely caught up in the way the light was playing off the clouds and the mountains. During the seven minute ride, I was able to evaluate the situation and plan a trip to a spot near home to which I’d never been. From the moment I walked out the door of the school to the setting of the sun was well under an hour’s time. That’s why you have to have your eyes open. I liked this last photo of the glacier. 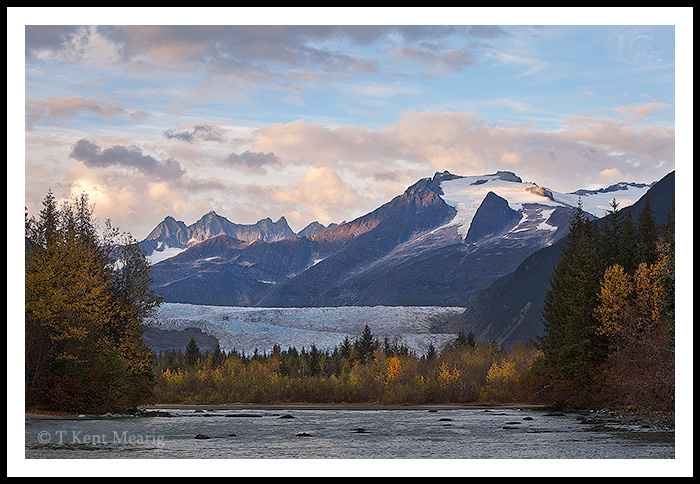 “Mendenhall river” The sun shining on the mountains is nice.